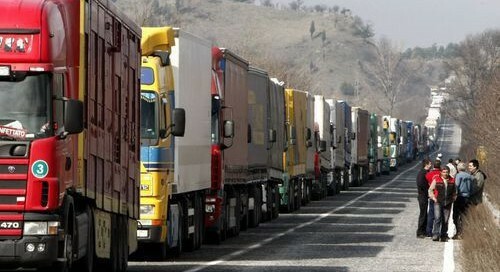 The queue of lorries at the Bulgarian-Turkish border resulting from the dispute between the two countries over truck transit permits reached about 15km on the morning of February 12 2014, public broadcaster Bulgarian National Television said. Hauliers involved in protests against the situation said that they were considering a full blockade of the Turkish border, allowing no vehicles to pass if there was no solution from the Turkish authorities. Turkey took reciprocal action at the end of January after Bulgaria issued only a fraction of the agreed number of permits for truck transit. Lorries have been held up at the border for up to 12 days. Small companies have been staging the protest for several days, barring the passage of lorries but allowing buses and passenger cars to pass. For the full story, please click here. The Sofia Globe team can testify that upholding the globe is reminiscent of the work of Atlas. Please support us in continuing to offer - as we set out to do when we launched in June 2012 - journalism that is truly independent and informed. All donations are gratefully received as we put in place our plans to grow in the years ahead. The Sofia Globe provides news, features, insight and analysis about Bulgaria, Central and Eastern Europe and the wider world according to the high professional standards of independence and objectivity that we have set ourselves in our Editorial Charter. Read more about us. Действителен собственик на настоящото издание е Клайв Левиев-Сойър.